Choose a link below to learn more about the Light-Life® Tools. Subtle energy Light-Life® Tools are the invention of researcher and biochemist, Slim Spurling (1938-2007), who brought the ancient benefits of quantum physics into the hands and homes of people who care about personal and planetary wellness. 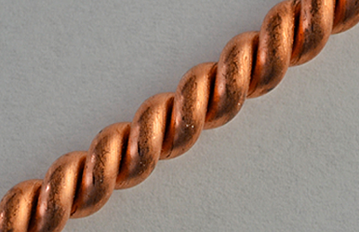 It begins with a simple cubit length of copper wire twisted and folded back into itself to make a ring. The ring creates an open space or "active area" known as the tensor field. Whatever is placed within the circle or sphere of influence is enlivened and positively effected by the field. Why Do These Tools Work? The tools are based on Sacred Geometry. The measurements used in tool making are taken from natural phenomenon related to the earth's structure, the speed of light, atomic weights, and atomic radii. Layering superconductive materials such as copper, gold and silver, a field of energy is created that appears to be identical to life force energy. With these tools the applications are limitless. Once the principles are understood,it's easy to see how individuals, communities, and the earth itself can benefit from this technology. Field tests have showns shifts when a tensor field is introduced. Some tests have shown the following subtle energy changes including: rapid healing of soft tissue and bone; pain reduction; enhanced water quality; reduced effects from noxious radiation; pollution of water, air and soil reduced; improved crop yields and pest control; improved gas mileage. The circumference of the Rings are ratios of the sacred, lost and new cubits. They are derived from ancient geodesic studies of the sun-moon-earth relationship. The sacred cubit was the standard measurement used to construct the King's Chamber Pyramid. The term “sacred geometry” is often used to refer to architectural forms and is applied to those proportions, shapes, and patterns that reoccur regularly in nature. The ancients observed these endless repetitions of the same numerical relationships and gave this geometry a divine significance. Our entire universe is shaped according to set geometric values. These patterns arrange the cells in our body and define the distance between the stars and planets. The Essence of Spirit can be encoded in measure and number. These measurements are related to mathematical constants. Slim collected evidence for the existence of cubit lengths recorded in the ancient world. Sacred Cubit seems to impact three dimensional or physical conditions and defines solid matter. It has a natural resonant frequency of 144 MHz. This length carries specific frequencies or wavelengths that restores the regulatory function of the body and promotes healing. Lost Cubit has a natural resonant frequency of 177 MHz. Whatever we think becomes real. Our thoughts, our consciousness creates a field. The ancients knew this. The lost cubit has to do with physical longevity. It may contribute to the DNA's ability to change at will. Empowerment Cubit seems to support mental clarity as well as enhance healing on all levels. The Harmonizer© increases the orbital radius of every electron in its field of operation. When sound is added (via the environmental clearing compact disc), toxic chemical elements in polluted air experience expansion or loosening of the orbital radius of every single electron boosted due to the field effect of the Harmonizer©. The sound creates the scalar waves and acts as a universal solvent. With the Environmental Clearing CD, loosened chemical bonds disintegrate. Atomic and molecular bonds in the toxic elements are broken down into their basic components. In molecular forms elements are poisonous. When the molecular bonds are broken they cease to be toxic. Harmonizers© transmute (change one element into another). In this case carbon monoxide is transmuted to nitrogen. The Environmental Clearing CD is a recording of the molecular frequencies of water. When these frequencies are added to the energy field of the Harmonizer© a large area benefits and there is an increase in vitality of all living things within this range. In March of 1994 Slim and his associates lifted the famous Brown Cloud from Denver, CO. 10 Harmonizers© were set up strategically throughout Denver and the outskirts. At one in the afternoon on March 18,1994 all 10 were activated for one hour with the Environmental Clearing CD. At 7pm that evening the air around Rocky Flats was crystal clear. The Harmonizers© continue to this day to clear the pollution there. Crime rates also fell as a positive side effect of the use of the harmonizers. His next step was seeking funding to purchase an infrared analyzer to know what exactly happens to the pollutants. What he suspected that happens is that carbon monoxide disappears first. There is an actual transmutation to nitrogen (the normal component of the air). Sulphur dioxide, hydrocarbons, nitrous oxide are all shifting into something else. To verify this would be so exciting and important! I would love to see this phase of the work get carried on and be a part of it. We have had approximately 20 Harmonizers© of various sizes activated in the Capital District for over 5 years. The air is improving (various articles have been printed in the local newspapers acknowledging significant positive change in the amount of pollutants in the air) and we will continue our commitment in this arena. See map for the areas affected. Geopathic stress is the Earth's vibrations that rise up through the Earth and are distorted by weak electromagnetic fields created by subterranean running water, certain mineral concentrations, fault lines and underground cavities. The vibration distorted becomes abnormally high and harmful to living organisms. Since geopathic stress is associated with illness, it is an important arena to address in our every day life. Slim Spurling says it is the negative factor behind all illnesses. Diverting the lines through earth acupuncture is a simple, easy way to support changing this dangerous phenomenon. Slim did this work for many years and witnessed significant improvement in people's health as well as environmental improvements, such as plant life flourishing. Benefits of Stress Reduction through diverting the lines: Encourages sleep; Fights infection; Oxygenates tissues; Promotes mental acuity; Reduces inflammation and fluid retention; Supports biological healing. Through the use of dousing and copper rod placement in the ground stress lines can be diverted. In the Albany, NY area interested parties can contact Ellen Myers for more information. Her website is www.geohealing.net. Also, more information can be found in the book “In The Mind Of A Master”, by Susan Anderson with Slim Spurling. This is available for sale through this website. Why put Rings around your water? The rings add "a higher form of energy" to the structure of the hydrogen atom. When the radius of the hydrogen atom increases the orbit of the electron changes. Water must change because 2 hydrogen atoms and 1 oxygen atom must rearrange their own internal geometry in order to conform to the new energy level. The light field above or below the Ring appears to relax the cell membranes to allow better oxygen/nutrient/waste transport in and out of the cell. The field of possibilities or tensor field within the ring is as wide as the circumference of the ring and extends in a column above and below, we don't know how far. (Slim measured effects at 10 miles). Rings vary in size and are all harmonics of the cubit. The science represented in the ring technology is both ancient and modern. The sacred cubit length of 20.6” is the controlling factor in the construction. It is the yardstick used in building the Great Pyramid. The lost cubit is a bit larger than the sacred cubit. The measurement is derived from the sum of the polar and equatorial circumferences of the earth divided into the speed of light. Large rings can be used as an aid in meditation and clearing energy fields. They can be placed on the body for healing as well as around glasses of water, food, faucets, and plants for revitalization. The 3 1/2 cubit rings can be placed on top of the refrigerator to add life force to food (I have found organic vegetables last longer) or buried under a transformer to eradicate the Hartmann Grid (the dangerous grid from power lines). When placed in the back seat of a car behind the driver seat, the ring infuses the spine with the field and keeps it protected while driving through geopathic stress lines (higher frequencies dangerous to our health). The Coils use the same principles as the ring but with an induced flow of energy. Because the coil draws negative energy through itself and transmutes it to positive, these are effective pain reduction tools. The Feedback Loops are omega-shaped and smaller in diameter than the coil creating a higher velocity flow of energy. Because loops pull out energy at a certain frequency - let's call it pain - and returns it at a 180º out-of-phase frequency, the original frequency gets canceled. The Harmonizer© is a combination of the ring and the coil. It emits a cosmic light field and has a positive output. The configuration of three rings in a vertical plane with a coil in the center gives us a spherical or toroidal field. Harmonizers© take the tensor energy out into the world. They radiate great distances. Negative energy sweeps in through the bottom, positive comes out the top in a constant flow. The Environmental Harmonizers© reduce electromagnetic interference in a home, clean the air in the house, and improve the outside environment. The yard, neighborhood, and town within a 15 mile radius benefit from one individual having one in their home. The larger agricultural harmonizer has a 65 mile sphere of influence and the personal harmonizer, worn around the neck or in a pocket, has a 5-7' radius. The Nose Mask brings the tensor field to the face for help with allergies, colds and asthma. The Lotus Pendants are derived from the Seed of Life, which in turn is the base of The Flower of Life. This is a template that contains all other geometrical forms. It is called the Flower of Life because it represents the cycle of a fruit tree. This structure forms the basis of musical harmony. The distances between the spheres in the mandala are identical to the distances between the tones and half tones in music. It is also identical to the cellular structure of the third embryonic division. This structure created the human body and all other energy systems. It may be considered the blueprint to life. Wearing a lotus pendant has many rewards. I have found it to be a gentle support for self-change. 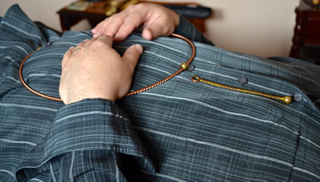 The Acupressure Tool is a harmonic antennae ¼ lost cubit in length. By placing it on acupressure points the proper frequencies are reintroduced to the body. The Phone Rings are a 1/8 Lost Cubit Ring and one 1/8 Sacred Cubit ring sewn into a leather case with an adhesive for attaching to an electronic device. By attaching the phone rings on the back of your cordless or cell phone you limit exposure to electromagnetic pollution which is harmful to our cells and damages our DNA. You may also use them on laptops, tablet computer and e-book readers. Potentized Water is created using the configuration of the feedback loop, coil and ring around a pitcher of water, and this improves the quality as well as the vitality of water. Less is better to start with as detoxification may occur. “I had increased range of motion in my shoulder after sleeping with a ring under my mattress.” – Brad S.
"I cut my finger and was not able to bend it. After 45 minutes of using the feedback loop over the cut the infection was pulled out. I watched the swelling go down and mobility return." - P.H. “I put a 3 1/2 cubit ring under the mattress of my guest bed. A friend visiting noticed healthier colon improvement with 24 hours.” - J.P.
“My neck pain is almost non-existent from wearing a ring around my neck whenever I notice it starting to feel strained.” - S.D. “I have been drinking potentized water for 4 years now. It has helped my energy levels improve significantly.” - V.H. The map below shows the various harmonizers that are active around the Albany, NY area. The circles indicate the range of each harmonizer. Not shown are the 2 Gold Plated Matrix Harmonizers - field range is vast and unknown at this time. For more information about the Light Life® Tools or to order, please email Virginia. You can also order Tools on our Product page, using our new shopping cart system.